The miracles of Jesus were another form of service and in every instance this helped others come to know Jesus himself. In this lesson children will learn how their service can help bring people to Jesus too. It is part 5 of the “Servanthood for Kids Series” we will be posting over the month of September. OBJECTIVE: To discover how Jesus’ acts of service through the first miracle and healing pointed others to believe in him as the Son of God. MAIN IDEA: Jesus served others through miracles and healings because he knew it would draw people into a relationship with him. Even though Jesus was perfect and had extraordinary powers given to him by God, we should strive to follow his example by leading others to him when we serve. Explain that Jesus became known for his miracles and healings once his ministry started and people travelled many miles to see him. Say, “The first miracle was when Jesus turned water into wine. Let’s read why this was an important event.” Read John 2:1-11. Explain to the students that wine was a common drink in Jesus’ day (much like sodas today), and it was especially used for celebrations. Ask, “Why do you think it was a big deal that there was no more wine left?” Add that a wedding feast during Jesus’ day usually lasted about a week, so running out of wine (because there wasn’t always clean water to drink) would have been a catastrophe. Question, “So why was it meaningful that Jesus provided more wine? What should we take away from this miracle?” Emphasize that this first miracle showed Jesus cared about others, had power as Messiah, and could easily provide something of incredible worth. Also make the distinction that Jesus turned the water into “good wine” because he only gives the best of himself (as pictured when he gave up his perfect life to die on the cross). Transition into Jesus’ first healing by reading John 4:46-54. Point out that his first healing was also in Cana of Galilee – the same place where he had turned water into wine. Also show the bible map and explain that Capernaum was approximately 20 miles from Cana (but still in a Galilee), or approximately a day’s worth of travel on foot. Ask, “So, what is amazing to you about this healing?” Explain that an official in that day would normally send a messenger, but because of the terrible situation the official came in person. And all Jesus had to do was speak and the boy was healed! In addition, the official’s entire household believed in Jesus because of the healing. Say, “Jesus healed the boy just by saying a few words. Never underestimate Jesus’ ability to help us in our struggles! Through this first healing he showed us that even his words have power.” Remind the students that when we serve we will witness God doing amazing things not only in our lives, but in others’ lives as well. 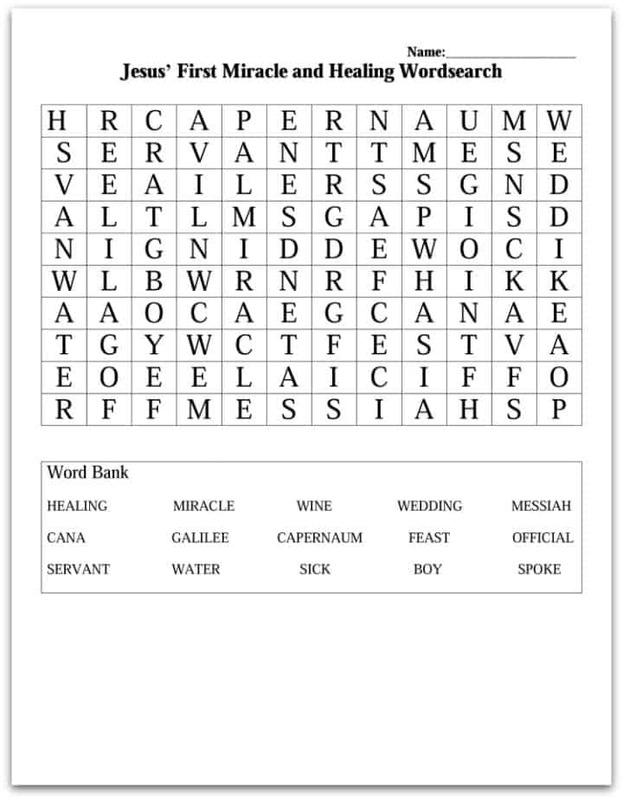 Pass out the “Jesus’ First Miracle and Healing Wordsearch” pages to review the lesson. Consider allowing students to work with a partner. RECAP: Jesus’ first miracle and healing showed that he truly was the Son of God and that service should be about leading others into a relationship with him.